We are proud to announce that aXpire has been accepted as full members of the Florida International Bankers Association, a non-profit trade association serving the needs of the Floridian and Latin American banking communities, aiming to improve and uphold the quality of international banking. 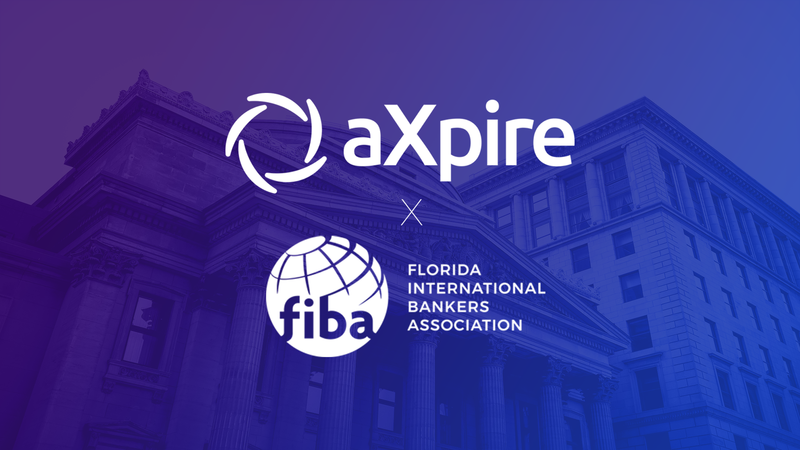 With a focus on compliance, anti-money laundering (AML), and bringing the best technologies to its members — FIBA has recognized aXpire as a leading FinTech and Blockchain company, and we shall be very active in educating and driving these industries forward through our membership with FIBA. We are aware that our technology is disruptive, and as such, we will strive to educate and further others’ understanding of why that is so. FIBA membership provides aXpire with access to hundreds of banking members, and also provides a forum to share our current and future technology platforms. “We are truly honored to be a part of FIBA, and I feel confident aXpire will both learn from and contribute towards the principles, aims and objectives of the organization.